Scleromyxoedema is a rare systemic disorder characterized by a lichenoid papular rash. Although scleromyxoedema can involve any organ, very few cases of pulmonary involvement have been reported. Moreover, there are no reports in the literature on treatment of this condition, especially with lung transplantation. The authors report a case of scleromyxoedema in a young man with neurological, skin and respiratory involvement, the latter being mainly characterized by pulmonary emphysema. Due to the serious respiratory compromise, and to the stability of the systemic lesions, a bilateral lung transplantation was performed with successful results at 4.5 yrs. In conclusion, lung transplantation may be required in patients with severe respiratory failure caused by scleromyxoedema. 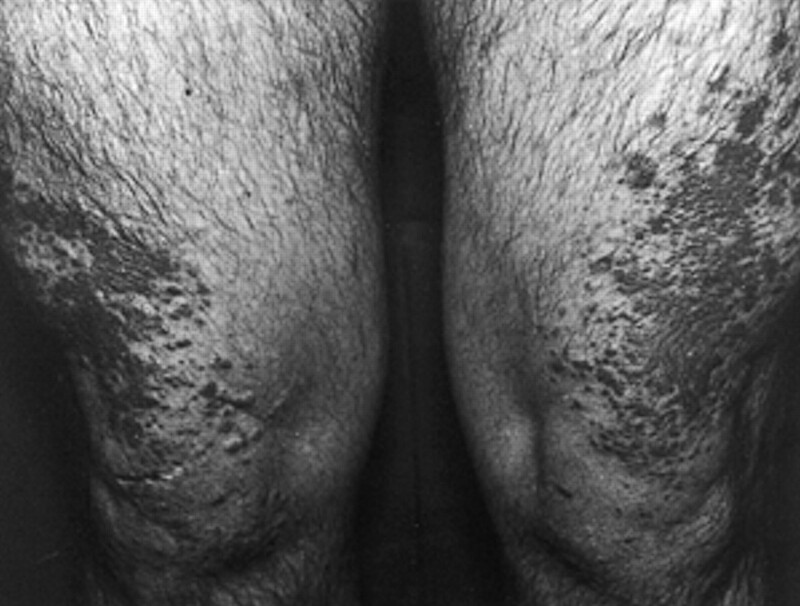 In 1954, Gottron 1 coined the term scleromyxoedema to define a rare condition characterized by a lichenoid papular rash. Several studies confirmed that scleromyxoedema was primarily caused by accumulation in the skin of a mucinous material consisting of mucopolysaccharide acids (MA), particularly hyaluronic acid 2. A monoclonal paraprotein of the immunoglobulin (Ig)-G lambda type has been detected in most patients with this disorder 2. The occurrence of neurological symptoms and/or myopathy in some patients led to the suspicion that there was a systemic form of the disease, which was confirmed after the abnormal deposits were found in the media and intima of the blood vessels, resulting in a decreased luminal size. Although scleromyxoedema can affect any organ, very few cases of pulmonary involvement have been reported 2–5 and no reports relating scleromyxoedema with other respiratory disorders have been published to date. The authors report here, a case of scleromyxoedema in a young man with neurological, skin and respiratory involvement, the latter being associated with pulmonary emphysema. Due to the serious respiratory compromise and the stability of the systemic lesions, a bilateral transplant was performed, with successful results at 4.5 yrs. A literature review of scleromyxoedema cases with pulmonary involvement is also provided. A 38-yr-old male office worker had smoked a pack of cigarettes daily for 13 yrs until 7 yrs before. He had no history of respiratory environmental risk. No drug or substance abuse was reported. The patient was first admitted to hospital aged 28 yrs, due to a generalized tonicoclonic seizure diagnosed as viral encephalitis, although blood tests for neurotropic viruses were negative. Erythematous and papular indurated skin lesions associated with fever, as well as an IgG lambda monoclonal gammopathy both in serum and cerebrospinal fluid were found at that time. Multiple erythematous skin lesions were seen in his feet, knees, hands, forearms and superciliary archs 2 yrs later. These lesions had a lichenoid appearance (“red wine” papular lesions with sclerotic changes, oedema and thickening) (fig. 1⇓) and showed no clear response to oral corticosteroids. A direct immunofluorescence study was not performed. A progressive dyspnoea developed 2 yrs later, but chest radiography was normal. Pulmonary function tests at that time showed an obstructive ventilatory pattern: forced vital capacity (FVC) 3.30 L (88%); forced expiratory volume in the first second (FEV1) 1.97 L (62%); FEV1/FVC 56 (70%); minimally responsive to the administration of salbutamol (FVC increase 2%; FEV1 increase 6%). An additional generalized tonicoclonic seizure occurred, leading to coma for several hours. There were no neurological sequelae. An IgG lambda monoclonal gammopathy was detected. Serological testing for neurotropic viruses was negative. Several months later, coinciding with a new outbreak of skin lesions, a skin biopsy of the lower part of the left superciliary arch showed normal epidermis and thickened dermis with a dense proliferation of histiocyte-fibroblast-like cells, a large number of collagen fibres and spaces strongly staining with toluidine blue. The Giemsa's stain showed a slight increase in mast cell numbers. Colloidal iron and alcian blue stains showed a significant amount of MA in the deep dermis. Pulmonary function gradually worsened, until 2 yrs later the patient required continuous oxygen therapy. A diagnosis of scleromyxoedema with neurological, skin and pulmonary involvement was made. Oral cyclophosphamide (50 mg·day−1) was given, resulting in reversion of skin lesions and stabilization of neurological symptoms, but it failed to stop the rapidly increasing pulmonary impairment. Bilateral lung transplantation was therefore considered. Several tests were performed, to rule out the presence of lesions in other vital organs. A chest radiography and a high resolution computed axial tomography of the chest showed widespread hyperaerated areas, suggesting pulmonary emphysema with an increased diameter of pulmonary arterial vessels. Serum alpha-1-antitrypsin level was 219 mg·dL−1 (reference values 110–220 mg·dL−1). An echocardiogram showed increased calculated systolic pulmonary arterial hypertension (90 mmHg) with dilated right chambers. Left and right ventricular ejection fractions, estimated by isotopic ventriculography, were 55% and 50% respectively. Heart catheterization showed no valvular or coronary changes. A myocardial biopsy and an oesophageal motility study were performed, with no abnormal findings. Magnetic resonance imaging of the brain was normal. Antinuclear and antineutrophil cytoplasm antibodies were negative, as was serological testing for the human immunodeficiency virus. Calcium channel blockers, anticoagulant, and nasal oxygen therapy at a continuous flow rate of 5 L·min−1 were started. Intravenous prostacyclin as a continuous infusion (6 ng·kg−1·min−1) with a battery pocket pump was added later, with no significant decrease in pulmonary artery pressure (85 mmHg). Dyspnoea gradually worsened. Pulmonary function tests obtained 2 yrs later confirmed the occurrence of a severe obstructive pattern: FVC 1.65 L (44%); FEV1 0.7 L (22%); FEV1/FVC 34 (42%). There was also a marked decrease in the carbon monoxide diffusion capacity of the lung (DL,CO) 3.76 mL·min−1·mmHg−1 (14%); transfer coefficient (KCO) 1.07 mL·min−1·mmHg−1 (18%). Pathological studies performed on both lungs following lung transplantation confirmed abundant deposits of MA in the walls of medium and large vessels, with narrowing of the lumen and histological changes consistent with pulmonary hypertension, as well as disseminated destruction of the alveolar walls surrounding the vessels involved. These findings confirmed the diagnosis of scleromyxoedema associated with pulmonary emphysema. The patient remains asymptomatic 4.5 yrs after the transplant. The immunosuppressive regimen used initially consisted of cyclosporine (variable doses related to mean serum levels from 200–250 ng·mL−1), azathioprine (50 mg·day−1) and prednisone (10 mg·day−1). At present only cyclosporine and azathioprine are taken. The initial monoclonal gammopathy is not currently present. Pulmonary function tests are almost normal, with a persistent moderate decrease in DL,CO: FVC 3.08 L (85%), FEV1 2.31 L (75%), FEV1/FVC 75 (94%), DL,CO 14.96 mL·min−1·mmHg−1 (54%), KCO 3.6 mL·min−1·mmHg−1 (61%). The neurological symptoms have not recurred and the skin lesions are currently controlled with low doses of oral cyclophosphamide (25 mg·day−1). Scleromyxoedema, also known as generalized myxoedematous lichen or papular mucinosis, is an uncommon disease of unknown aetiology mainly affecting the skin as a papular rash with sclerosis and skin thickening 3. Its most usual histopathological presentation is in the form of infiltrating skin lesions with mucinous deposits (particularly hyaluronic acid) mainly in the papillary dermis, which stains with alcian blue or colloidal iron 2. These lesions usually appear in arms, legs and face, and the patients show a strange “leonine face” 6. Although scleromyxoedema occurs mainly in the skin, it may involve any organ, which explains the high rate of patients showing both clinical and laboratory systemic signs 2–4, 6, 7. Gabriel et al. 2 reported 19 patients with extracutaneous involvement seen at the Mayo Clinic, whereas Dinneen and Dicken 4 found that 20 out of their 26 scleromyxoedema patients (76.9%) studied at the same centre during a longer period, also had systemic symptoms. A myxoedematous deposition in the blood vessels resulting in luminal narrowing is the rule 4. Neurological and muscle involvement are not uncommon 2, 5, 8, 9, and the most frequent finding is a circulating paraprotein (gammopathy) in the form of a monoclonal IgG peak with lambda light chains, found in >90% of patients, which confirms the diagnosis 1–3. The case reported here had remarkable characteristics, in that it was a severe systemic scleromyxoedema associated with pulmonary involvement, and that it led to the first lung transplantation reported in a scleromyxoedema patient to date. A histological study confirmed the diagnosis of scleromyxoedema and its association with pulmonary emphysema. Causality, in this exsmoker, remains to be established. Pulmonary involvement in scleromyxoedema is rare, and only 10 cases have been reported to date 2, 3, 5, 9 (table 1⇓), only one of which was histologically documented 3. Farmer et al. 10 reported two scleromyxoedema patients with pulmonary emphysema in a post-mortem examination, but found no myxoedematous deposits in the pulmonary vessels. Fudman et al. 5 first reported a diminished DL,CO in pulmonary function tests. Gabriel et al. 2 found pulmonary involvement, as exertional dyspnoea, in six of 19 patients, five of them had decreased DL,CO and three decreased pulmonary volumes. Dinneen and Dicken 4 reported pulmonary signs in seven of 26 scleromyxoedema patients, with exertional dyspnoea in most cases. Three of these patients had already been reported by Gabriel et al. 2. Dinneen and Dicken 4 also reported another two patients with airflow obstruction, but gave no description of the severity of the ventilatory pattern. Godby et al. 3 reported a new scleromyxoedema case with pulmonary involvement in whom a chest radiography showed increased pulmonary artery diameter as well as a decreased peripheral vascularization suggesting a restrictive disease not substantiated by spirometry. Post-mortem studies later confirmed pulmonary involvement by the deposit of a large amount of mucinous material that was positive for alcian blue in the intima and media of the middle-sized blood vessels. The presence of mucin deposits in blood vessels, as reported in several studies 2–4, 6, may account for the occurrence of severe pulmonary hypertension and decreased DL,CO in the patient in this study, whose picture was even more severe because he also had pulmonary emphysema. The development of pulmonary emphysema in this patient may be difficult to explain. He was only 30-yrs-old when the obstruction was first noticed, and although he had smoked one pack of cigarettes every day for 13 yrs, such aggressive and early emphysema is unlikely at this age. No other causes accounting for his chronic obstructive pulmonary disease, such as α1-antitrypsin deficit and/or environmental exposure, were found. This led the authors to consider the possible precipitating role of scleromyxoedema in the development of pulmonary emphysema in this patient. However, abnormal deposits of this material were only found in blood vessels, and not in the remaining pulmonary interstitium. In this regard, a relationship remains elusive. Patients with a history of systemic disease were not considered in the past as transplant candidates since they may be at risk for increased progression of the underlying disease 11. Lung transplantation for treatment of respiratory failure resulting from systemic diseases currently remains controversial 12. However, some publications 11, 12 concluded that patients undergoing transplantation for such diseases have an acceptable morbidity and a satisfactory survival if pulmonary signs had been their predominant clinical features, as occurred in the patient in this study. The patient had severe pulmonary failure due to both scleromyxoedema and pulmonary emphysema, with stability of the systemic lesions. These results are consistent with those of Levine et al. 11 and Pigula et al. 12, and this patient remains asymptomatic 4.5 yrs later. To conclude, scleromyxoedema continues to be an idiopathic disorder with a very low incidence. Since it may be potentially severe due to pulmonary involvement, lung transplantation could be a therapeutic option for patients with controlled systemic lesions. Gottron HA. Skleromyxodem (a different myxoid deposit in the dermis). Arch Dermatol Res 1954;199:71–91. Gabriel SE, Perry HO, Oleson GB, Bowles CA. Scleromyxedema: a scleroderma-like disorder with systemic manifestations. Medicine 1988;67:58–65. Godby A, Bergstresser PR, Chaker B, Pandya AG. Fatal scleromyxedema: report of a case and review of the literature. J Am Acad Dermatol 1998;38:289–294. Dinneen AM, Dicken CH. Scleromyxedema. J Am Acad Dermatol 1995;33:37–43. Fudman EJ, Golbus J, Ike RW. Scleromyxedema with systemic involvement mimics rheumatic diseases. Arthritis Rheum 1986;29:913–917. Davis ML, Bartley GB, Gibson LE, Maguire LJ. Ophthalmic findings in scleromyxedema. Ophthalmology 1994;101:252–255. Chanda JJ. Scleromyxedema. Cutis 1979;24:549–552. Webster GF, Matsuoka LY, Burchmore D. The association of potentially lethal neurologic syndromes with scleromyxedema (papular mucinosis). J Am Acad Dermat 1993;28:105–108. Catalá J, Lòpez-Aldeguer J, Vilchez JJ, Chirivella M, Catalá MT. Scleromyxoedema related to mypopathy. Rev Clin Esp 1993;193:119–121. Farmer ER, Hambrick GW Jr, Shulman LE. Papular mucinosis. A clinicopathologic study of four patients. Arch Dermatol 1982;118:9–13. Levine S, Anzueto A, Peters JI, Calhoon JH, Jenkinson SG, Bryan CI. Single lung transplantation in patients with systemic disease. Chest 1994;105:837–841. Pigula FA, Griffith BP, Zenati MA, Dauber JH, Yousem SA, Keenan RJ. Lung transplantation for respiratory failure resulting from systemic disease. Ann Thorac Surg 1997;64:1630–1634.